What Is Gender-Based Violence & Abuse? Access to safe accommodation is crucial for women affected by gender-based violence and abuse. Women affected by multiple disadvantage often face barriers to accessing suitable housing, and therefore safety. Gender based violence and abuse is a key cause of homelessness. Around 13% of all homeless acceptances are related to domestic violence. Research indicates that domestic violence is the main cause or a contributing factor towards women becoming homeless in up to 40% of all cases. The links between gender-based violence, mental ill-health and substance use are well documented. Yet, for women with these experiences safe housing is often difficult to access. Our research found that many refuges take women who disclose substance use or diagnosed mental ill-health on a patchy basis. It has become even harder for Black, Asian, Minority Ethnic and Refugee (BAMER) women to access safe housing as specialist BAMER services have been disproportionately hit by funding cuts. This means that BAMER women are increasingly left without services that meet their needs. Our research found the situation is even harder for BAMER women affected by multiple disadvantage. Two out of the three specialist BAMER refuges we surveyed were unable to take women with substance use or a mental health diagnosis. For women who are unable to access refuges, homeless accommodation is often not fit for purpose. Research by the charity St Mungo’s found that the majority of their homeless female clients had experienced gender-based violence and had been unable to access housing services to meet their needs (St Mungo’s, Rebuilding Shattered Lives). The evidence is clear that women affected by multiple disadvantage often struggle to access safe housing, and therefore safety. With these gaps in provision in mind, Trust for London has funded us to work with six refuges and two housing providers to improve the provision of safe accommodation for women with experiences of gender-based violence, substance use and mental ill-health. Work with commissioners and service managers to improve monitoring in refuges to identify the number of women with substance use and/ or mental health support needs who are refused bed spaces. Improve risk assessment practices within refuges and housing providers through training and support for staff. Improve referral pathways to treatment providers. Work to ensure that BAMER women with substance use and/ or mental health support needs who are experiencing abuse can access specialist refuge provision. Explore options for funding specialist workers and services. Involve service users to inform and influence service delivery and the wider project. If you would like to know more about our work or how we can help improve services and standards in your housing service please contact us. 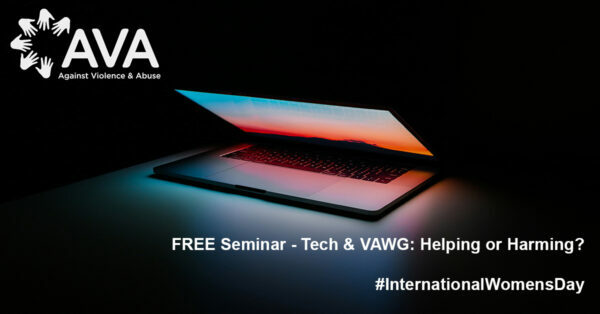 FREE SEMINAR: Technology and Violence Against Women – Helping or Harming? AVA is holding a seminar on international women day, 8th March at 1-5pm: Technology and Violence Against Women - Helping or Harming? Technology in the modern world is unavoidable and constantly changing. Women’s interaction with it is a complicated area that intersects with various forms of multiple-disadvantage and VAWG issues. This can both be positive and negative. The day was a really positive step forward in improving our responses to domestic abuse where there is also a drug and/or alcohol misuse issue. We were helped to form much closer and better working relations between both sectors… As a result of the session we have developed an action plan to build upon this work to continue to improve our links between sectors.